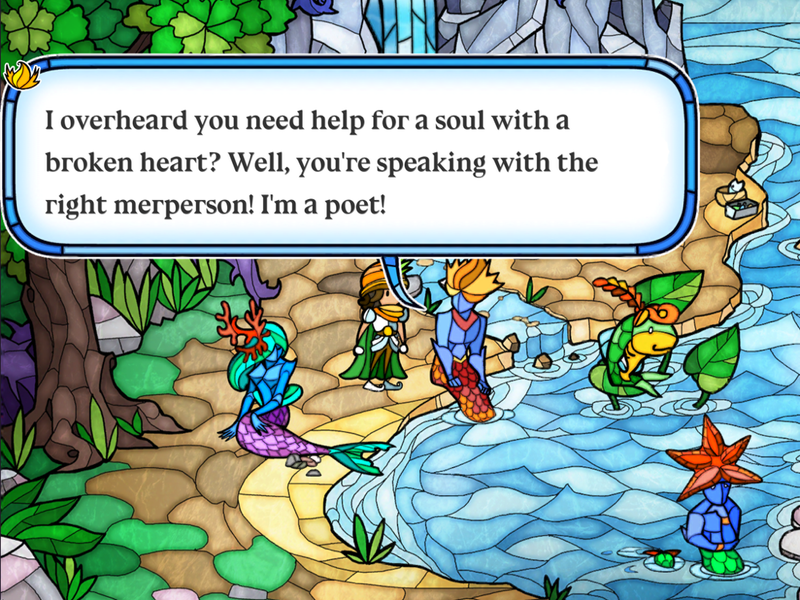 What you’ll notice first about Elf Games Works’ and Mangatar’s point-and-click adventure, Little Briar Rose, is the art style that’s meant to mimic stained glass, the kind you see in the beginning of Disney’s animated Beauty and the Beast. But that’s not the fairy tale being told here. Instead, it’s a version of the tale better known as Sleeping Beauty, in which a princess is put into a deep slumber by a wicked fairy and can only be awakened by true love’s kiss. While the story may sound cliche and overused, there’s enough here to make it surprising and fresh and worth experiencing. 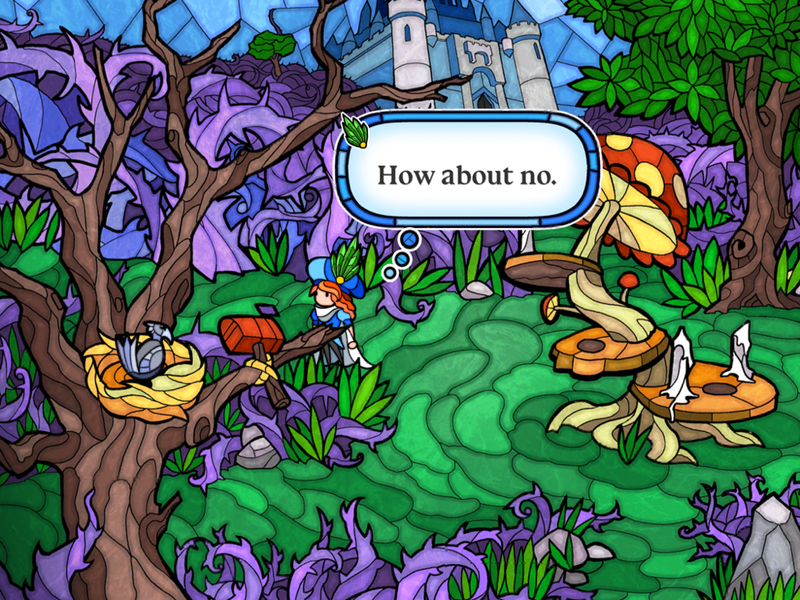 One of my favorite aspects about Little Briar Rose is the way it treats mistakes. You play as a prince setting out to wake Princess Aurora and save the kingdom. Throughout your journey, mythical beings like gnomes, fairies and mermaids will ask for your help. But they often talk in riddles instead of giving you precise instructions. This means that if you’re not careful you could misinterpret them or miss a vital piece of information. If you do make a mistake on one of these quests, they’ll get angry and turn you into one of those beings, ending that prince’s journey and dooming him to a confused existence as a gnome, fish, or other creature inhabiting the land. But you don’t have to restart the game or lose any progress. Instead, a new prince arrives and picks up where the previous one left off. Unfortunately, there isn’t a huge number of princes to cycle through, so if you’re careless you could find yourself repeating the same sprites. But it’s still a really creative way of dealing with mistakes and I just absolutely love it. It also fits the story well and plays a part in the ending, so it doesn’t feel like a cheap gimmick. As I said, a lot of the puzzles revolve around riddles and helping the locals. For instance, the gnomes ask you to build a library for them, and each of them has a specific detail they’re looking for in it. Another quest involves acting as a Cyrano de Bergerac for a Gremlin-like creature called a spriggan to help him woo a beautiful fairy. Some requests are less obvious than others, which can be a bit frustrating at times. I also had a hard time getting used to the fact that you could talk to someone and think they’ve said all they have to say and walk off, but it turns out you needed to keep prompting them to get more info. Perhaps it’s just not common with games I usually play, but this was unusual for me and caused quite a bit of frustration when I thought I exhausted all my options. But for the most part, as long as you’re thorough and keep talking to people, you should be able to figure out everything you need. Although the game takes place over about six or seven screens, you’ll have to keep revisiting them, so you don’t just finish up an area and move on. Everyone you meet might have a purpose you don’t know about yet, so you can’t just forget about them simply because they helped you once already. This is a very dialogue-heavy game, and at times it can feel like a bit too much, but there is a good amount of humor and lightheartedness that held my attention. Even the text that tells you you’re using the wrong item has enough variety to keep it interesting. For instance, using the same item on something could elicit a number of different reactions from the prince, such as, “How about no.” or “It would be discourteous!” or “They seem to be unaffected by the rare allure of this relic. How unfortunate.” I appreciate the effort that went into that to keep it from getting stale. There were also a few other frustrations here and there. It bothered me that certain things can’t be picked up at first but then all of a sudden can after some completely unrelated event. Or that items will appear that weren’t there before, again with no real explanation. It feels a bit cheap and has bothered me when I’ve seen similar things in other games. I understand if it’s triggered by a very obvious related event that would make you think of looking for or checking on the item. But I couldn’t figure out why I couldn’t pick up the rose in the beginning of the game but could after clearing out a path unconnected to it. Or why a mirror suddenly appeared out of nowhere. Since there’s no hot spot locator, players could miss these vital objects simply because they weren’t there the last time they looked. There are also some odd typos, but they’re rare. 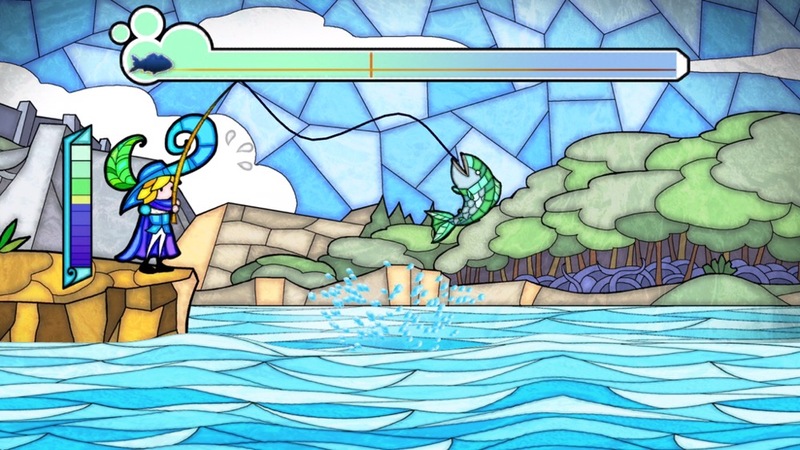 And I found the fishing mini-game to be frustrating and tedious, but once I got used to it, I was able to get through it with enough patience. The save system is also a bit too old school for my tastes, as there’s no auto-save feature. 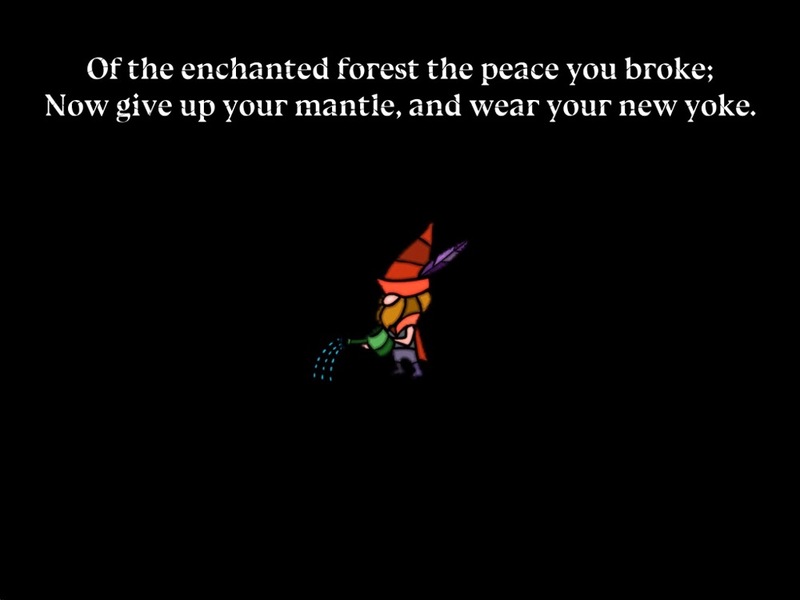 You have to make sure to walk over to the fairy at the beginning of the game to save before you take a break. If you don’t get into the habit of doing this frequently, you’ll end up having to repeat actions to catch up to where you were. Again, this can be tedious, but still manageable. I know it sounds like I have a lot of complaints, but there really is a lot more here to like than to hate. The stained glass artwork is delightful eye candy, and the quests are creative, even if they’re not perfect. I actually liked the challenge of having to figure out which items the characters wanted based on their riddles. And being unable to try every item without consequence forced me to pause and truly think about what I was doing before running in blindly. Yes, the game can use a few improvements, but I would still recommend it to any point-and-click fans looking for something different and unique. If you don’t spend too much time stuck, your time spent in this enchanted forest should last you a couple of hours. You can download Little Briar Rose here and make sure to tell me what you think of it! If you need more convincing, you can check out my gameplay video below and if you’re stuck, you can try my walkthrough here. thanks! got the game for my android.